I agree with you on what to do with the papers. Printing with the plate is so much fun – an the prints pile up. I´m more into collage than journaling but don´t do it often. Prefer kind of projects I don´t work on for ages. I´ve created a template for postcards 4 on A4 and like to pull prints with these as well as with folded greeting cards. Just have to keep in mind my inky fingers lol. Great post MA. I’m very distinctly in the ‘not going to bother’ camp. Mainly because I know myself well enough to know that after making a few backgrounds, I’ll be fed up with the process, the ‘potential’ of it will just stare me in the face and nothing I produce will look as it did in my minds’ eye. The thought of a pile of backgrounds that I won’t have a use for because by their nature they are arty and painty just adds to my own case. However, as you see, now I’m seeing results with the page after page printing and some of them are really quite lovely. I’m not ‘against’ Gelli plates, but I’m definitely not a customer and am probably likely to be one of the ‘walkers’ that Julie G mentions in her comment..after all, if I discover half way through that it’s never going to be for me, there’s kinda no point lingering; as long as it’s not a rude departure! How like you to give up crop time to demo. I love all techy gizmos but try to wait till I hear whether they really work before jumping in and buying. I did buy a gelli plate the 8×10 size. I really like it alot. I have had it for 3 months and have used it 5 times. It is addicting. I love the different prints you get using everyday items. I use the prints for cards and am planning to start a journal. 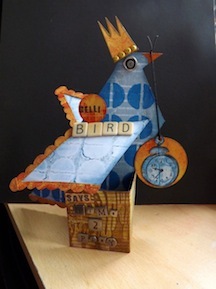 What got me hooked was Andy Skinners blog and the amazing prints he creates with stencils and the gelli. The cons are so many prints and so little time to use them all! Ok I am a tech geek I just love technology it goes along with my electrical training that I have already, so it is a power thing for me and I sponge it up and get excited, yep I am not normal, sorry about that but onto the gelli plate I seriously love it. I can’t use it enough and no it will not end up in the unused section of the craft room. 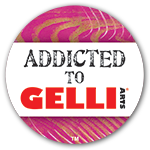 I can’t remember where I saw about the gelli first but when I did I then researched everywhere before purchasing it. Me? I love the techie talk. True geek, here. 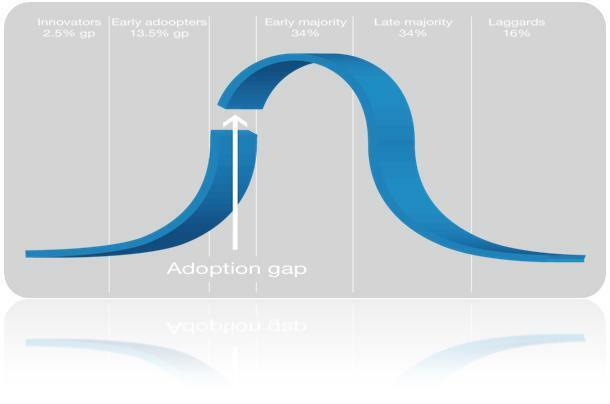 I w as familiar with the adoption curve, but I don’t recall seeing the gap; interesting refinement that is so logical. I haven’t checked out Gelli plates per se, but the first comment here confirms what I thought: this is today’s take on gelatin plate printing that my mom did in the 1970s. She used it to make many copies of announcements or post cards – a cheaper ditto maker of sorts. Very insightful comments. I was at a mega-crop on Saturday and was doing a series of demos with the Gelli Plate. Because it was primarily a scrapbooking crop I knew it would probably be a “hard sell” to that particular crowd. I took some scrapbooking related projects with me (layouts featuring diecuts from Gelli prints, mini-albums with Gelli print backgrounds, embellishments made from Gelli prints…flowers, tags, punched shapes, stamped images over a Gelli print). 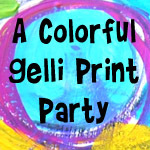 It was interesting to see the reactions…some who could see the versatality of the Gelli Plate and others who didn’t even stay for the whole demo (I’m assuming they are not the kind that like to get paint on their hands). I really think that for those that are just being exposed to it for the first time and are on the fence, they need multiple exposures and hands on experience to really get what I hear over and over again from the Gelli Plate community…that it is so freeing creatively, addictive, and just plain fun! I think any demos definitely have to be tailored to the audience…are you talking to the art journaling / mixed media crowd…they will really get it! Or are you talking to papercrafters…they need a specific project that shows them how to make really unique cards or layouts. There were also quite a few teachers at this crop event and it was interesting to hear their comments on what a fun project it would be for their class to try or as a birthday party craft idea for their kids at home. ooooh I like the look of that Android dongle whatsamajiggit. As for the gelli-plate epidemic (and it really does feel like an epidemic! ), I resisted for a long time as had made a ‘proper’ gelatin plate in the past and it’s easy enough, and I thought that the gelli-plates were overpriced. But I eventually gave in and I am glad I did (in fact I now have two sizes) as it’s SO much less of a faff than making up a gelatin plate, plus you don’t need to give it a shelf in the fridge 😀 Unlike some I’m not really into doing a mammoth printing session, I tend to just make a couple of sheets when I need them, and so it’s great being able to take it off the shelf, use it, put it away again, with no prior fuss. The Gelli Plate has been an interesting one for me. I thought that I NEEDED it, but was convinced that I needed an A4 version not the 6 x 6 so I sat and waited for it to come available in the UK. Sadly, everywhere was continuously sold out or too expensive as the plate went viral. Meanwhile I need to blog my afternoon with gelatine and paint and share in case others want to experiment before they buy.